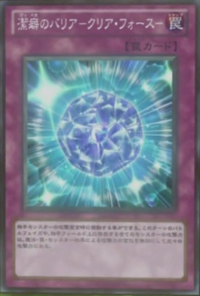 This card is not a member of the "Clear" archetype, because its Japanese name does not contain 「クリアー」. When an opponent's monster declares an attack: The ATK of all face-up monsters your opponent currently controls becomes their original ATK, also negate any card effects that would change the ATK of a monster(s) your opponent controls. These changes last until the end of the Battle Phase. This page was last edited on 30 September 2018, at 03:56.